What Will Contract Lifecycle Management (CLM) Do for Your Business? Most B2Bs still settle for slow and ineffective contract management. Why? Manual contracting processes are inefficient. Worse, they can ruin potentially great relationships with buyers, and they can miss critical opportunities to deepen relationships. Most businesses underestimate the cost of manual contracting. It costs 9%. What Is CLM? How Does It Drive Relationship Selling? CLM proactively manages the entire contract lifecycle. Advanced features streamline workflows by coordinating and tracking contracting activities leading up to the deal. After the close, CLM gives you more control over relationships with buyers. Request - The initial request for the contract will begin with a template. CLM software will either integrate with CRM to prepopulate data, or request basic information and then populate this data throughout the form. Generate - The initial contract is generated by the sales team and then automatically sent to the right contacts for approvals or to the client, tracking activity. Negotiate - Word Processing supports and tracks changes to the contract. Execute - An order is automatically generated from the signed contract and sent. Search/Report - The repository features of CLM support easy searching and reporting. Know how many contracts are about to expire. Gain visibility into the service portfolio. This can drive value for Head of Sales and C-Suite. Comply - Orders are tracked to ensure all contracts are being fulfilled. Amendment - If you want to grow your relationships with buyers, the initial contract is only a starting point. Amendment makes it easy to add services down the line. Closing - Know which contracts are about to expire, and deliver messaging to offer renewals at the right time. What's In It for the C-Suite? Contract Repository makes all contracts accessible – The repository feature of CLM is the bread-and-butter of CLM. Sales leaders can use the repository to identify upsell opportunities easily and conveniently. Contract Reporting and Analysis – Relationship-based B2Bs need to organize and analyze their obligations. This feature drives budget forecasting, profitability, and buyer behavior. Contract Authoring helps Sales construct the right contract, reliably – CLM streamlines contract generation for end users. Simply enter key information, and the system will recommend the most appropriate clauses and contracts. Workflow tools send drafts to the appropriate personnel for approval. Simple. Contract Integration – Companies that integrate CLM with other sell-side systems can create incredible value. 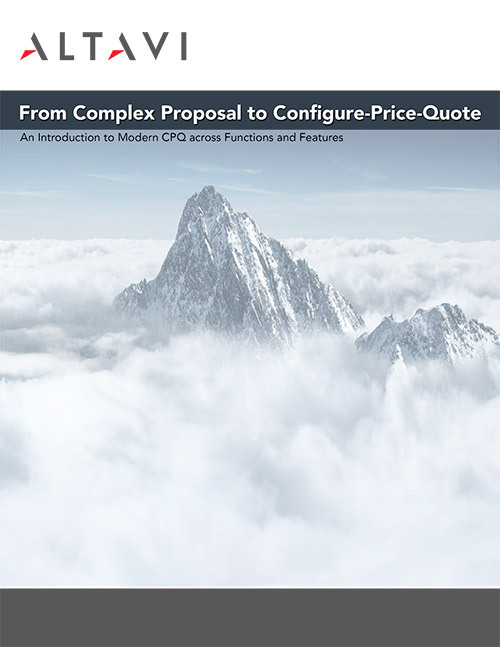 Configure-Price-Quote (CPQ), Customer Relationship Management (CRM), and Rebate and Incentive Management are the three most common integrations. *PayStream Advisors. “2016 Contract Lifecycle Management Report.” PayStream Advisors: Charlotte, NC, 2016. **Technavio Research. “Global CLM market expected to reach a revenue size of around US $2 billion by 2019.” Infiniti Research Limited: London, September 17, 2015. As your implementation partner, ALTAVI works collaboratively with clients to fill talent gaps as needed. Let us show you how to achieve more with your CLM integration.